Located just a couple hours outside of Los Angeles and nestled in the San Bernardino mountain range is the idyllic town of Big Bear, California. With its serene lake and pine tree forests, Big Bear offers no shortage of adventures, whether it’s summer or winter. Our crew recently spent the weekend exploring the area and put together a short guide to the ultimate weekend getaway in Big Bear. Snow can be hard to come by in Southern California, but Snow Summit is just a couple hours away from the LA area, making it an ideal destination for those looking to get a winter fix. With over 300 days of sunshine a year, you’re more than likely to be greeted with a bluebird day. While the snow may not be quite the same as a trip to the Rockies, it’s hard to beat a sunny day on the slopes with a good crew! There’s nothing better after a long day of skiing or riding than coming back to a warm, cozy cabin. When you’re looking for places to rent, we recommend finding a spot that includes a hot tub and a fireplace. 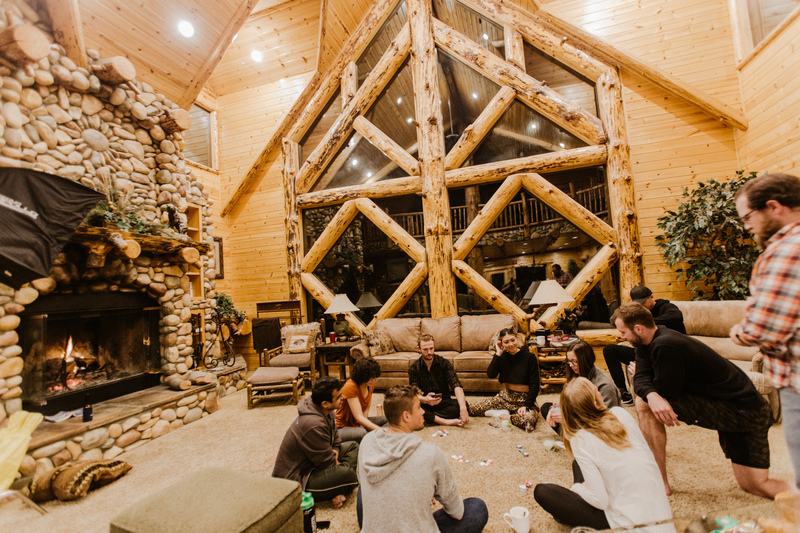 A round or two of group games after dinner is also a must for the complete cabin experience. Not into skiing? There’s still plenty of places to explore around Big Bear. One of our favorites is hiking up to Castle Peak for unbeatable views of Big Bear Lake and the surrounding area. Learn from our experience and make sure to check trail conditions before heading out. If there’s not quite enough snow for snowshoes, crampons or micro-spikes would be a great gear addition as the trail was icy and slick when we ventured out in late January. Do you have what it takes?! 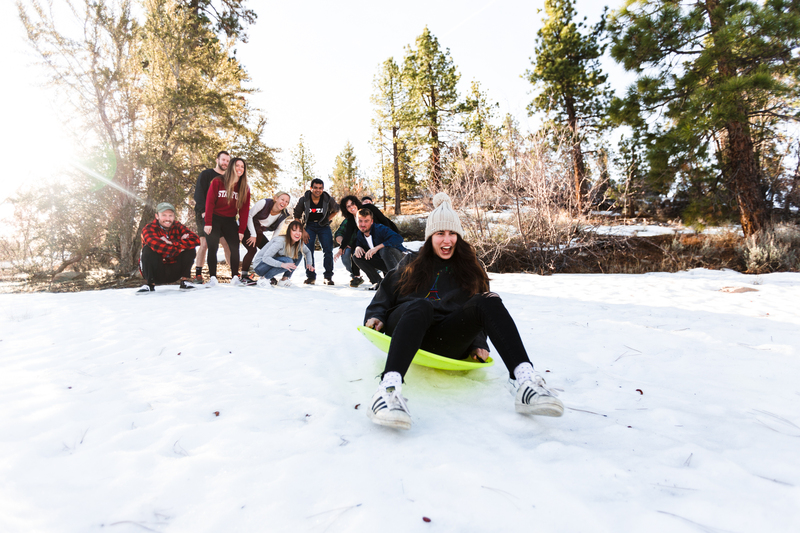 While Big Bear Lake is typically enjoyed during the summer months, if you and your crew are up for it, a polar plunge in the lake is a really fun way to start (or end) the day, and will be something you remember for a long time. That hot tub we mentioned earlier? You’re going to need it after this. 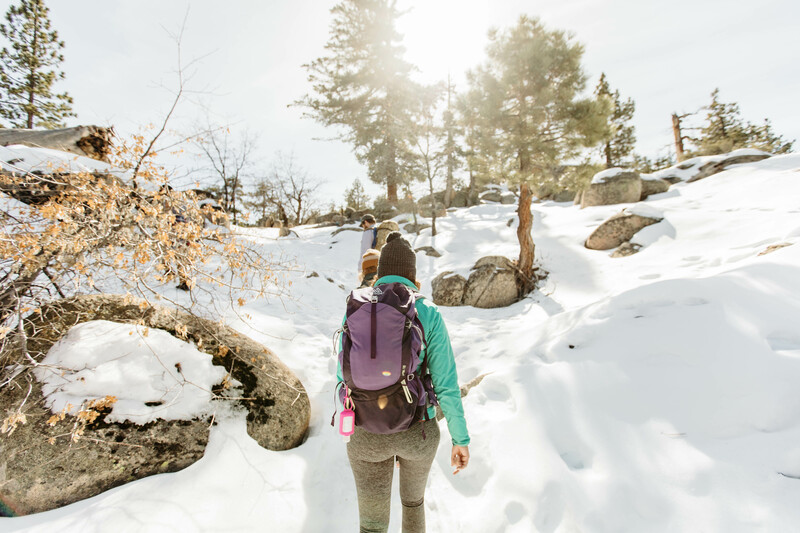 There are several places in Big Bear that have groomed and sledding specific hills, but we’d recommend forging your own path as there’s no shortage of free hills to explore and sled. If you’re not sure where to start, check out the hill below Grey’s Peak Trail. There’s usually plenty of parking and public restrooms. This is also a great way to get a workout in…hiking that sled back up isn’t easy! Grab a beer at Big Bear Lake Brew Co.
After a long day of snow adventures, a beer is much deserved. Big Bear Lake Brew Co is a friendly local brewpub, just South of the lakefront. The Whispering Pine IPA is a crowd favorite, but we hear the Bearly Legal Honey Blonde is as good as it gets. If you’re hungry, definitely try the Avocado Bomb, their most popular appetizer (for good reason). Any games that you didn’t finish at the cabin can be continued in this laid back spot. And there you have it! The perfect Big Bear weekend. If you manage to check off all of the things listed above, you’re bound to have an unforgettable trip.